18 holes, par 71, 6,632 yards. Links. 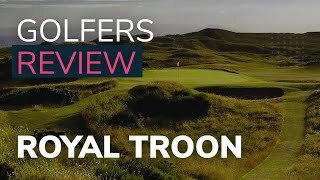 The outstanding Old Course at Royal Troon Golf Club has hosted The Open Championship on numerous occasions and the fairways have been graced by nearly all the major golf professionals out there. Tom Watson, Arnold Palmer, Justin Leonard, Todd Hamilton, Nick Price are just some of the names who’ve prevailed when The Open was held here. The course is located in Ayrshire on the west coast of Scotland and like its more famous neighbour Turnberry, the Old Course skirts and tussles along the rugged coastline where visiting golfers can enjoy some of the most stunning sea views. Look west across to the Isle of Arran or south to the famous Ailsa Craig, this is one of the most spectacular locations for a golf course. Although not the longest of courses on The Open rota, length is not the challenge here, hitting the ball straight is. There is a litany of bunkers, long rough and ample gorse to ensure any wayward shots are consumed never to be found again. This is before we even begin to consider the elements. When playing Royal Troon, not only can you claim to having played the longest par-5 on The Open circuit, you can also claim to have played the shortest par-3 at 123 yards, ‘The Postage Stamp’ as it was nicknamed by golf journalist Willie Park. The ‘Royal’ was added to the name in 1978 during the club’s centenary celebrations by Queen Elizabeth II. When you think of taking a golf holiday to Scotland, the Old Course at Royal Troon golf club just has to be on the list of courses to play and there is a good reason it is regularly ranked in the world’s Top 100 golf courses. The dress code excludes rugby/football tops, denim jeans, t-shirts and any tops with slogans. There is also an expectation that shirts should be tucked into trousers at all times. Metal spiked shoes and waterproofs are allowed in the locker rooms but nowhere else in the clubhouse. Jacket and tie must be worn in the dining room and smoke room. Handicap certificates are required with a maximum handicap of 20 for gentlemen and 30 for woman. Caddies are available to be booked, but must be done so well in advance and at the time of writing cost £50 per round (Feb, 19).